The way you present yourself not only influences others’ perceptions of you, but also impacts your own self-confidence. Feeling good about yourself will be reflected in your bright and positive attitude, making your interview or presentation more effective. Don’t know where to start? 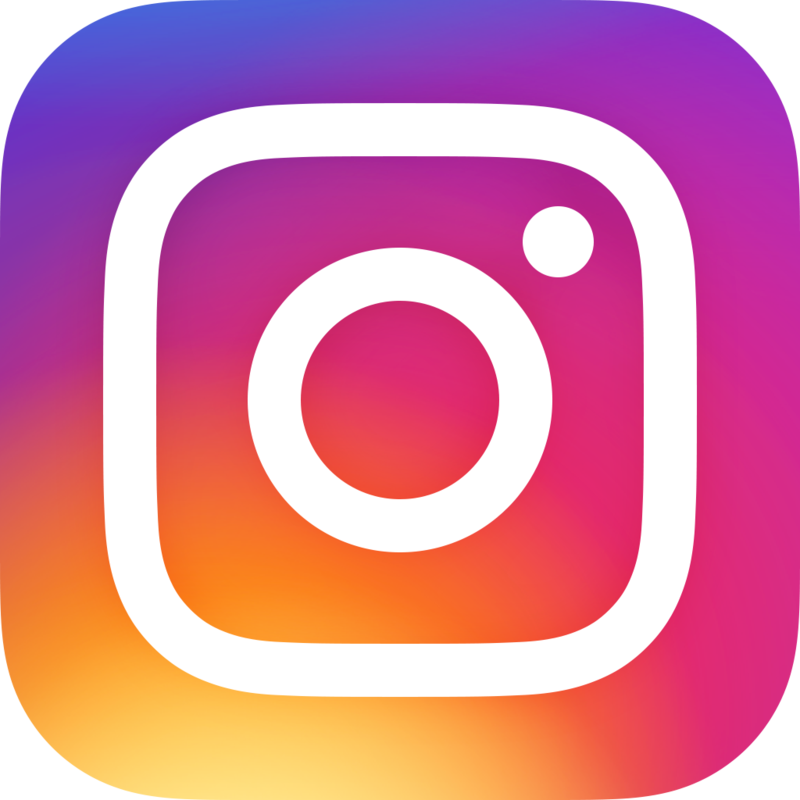 Here are three common pitfalls that are sure to make you look amateur and disoriented – but the good news is, they can be instantly improved – for free! Pardon the large watermark. And pants. OK, this is the one fix that might not actually be free if you don’t already own an alternative pair of trousers. But if you are the owner of pleated pants, seriously considering throwing them away. And by that I mean throwing them away – not donating or selling. That would be kind of like passing on a gypsy curse – you’ll be rid of it, but only through inflicting it upon another innocent person. 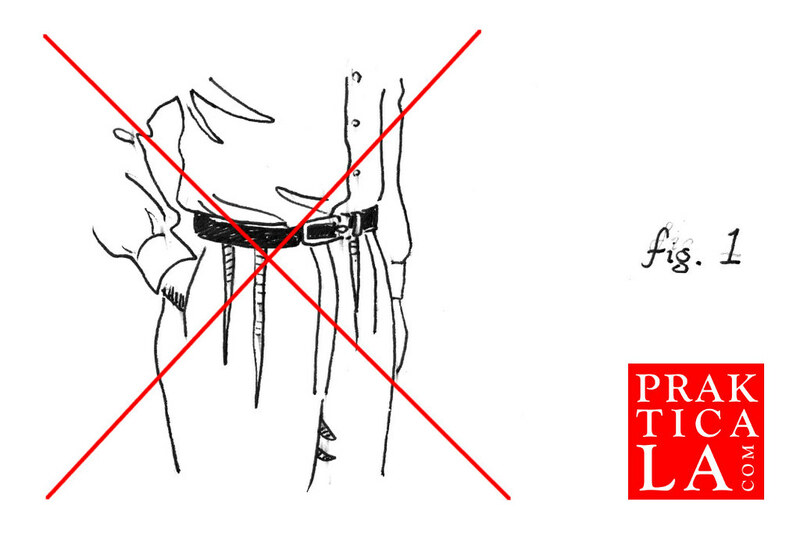 Pleats are those extra folds of fabric that are sewn into the front of pants worn by old people and con men (see fig. 1). Puffy and frumpy, they make your pants look like a parachute or Princess Peach’s dress. Unless you are built like Shaq or are a mobster from the 1930’s, you have no business wearing them. Wear flat-front pants instead and welcome to the post-WW2 era. Hopefully you have a pair somewhere. 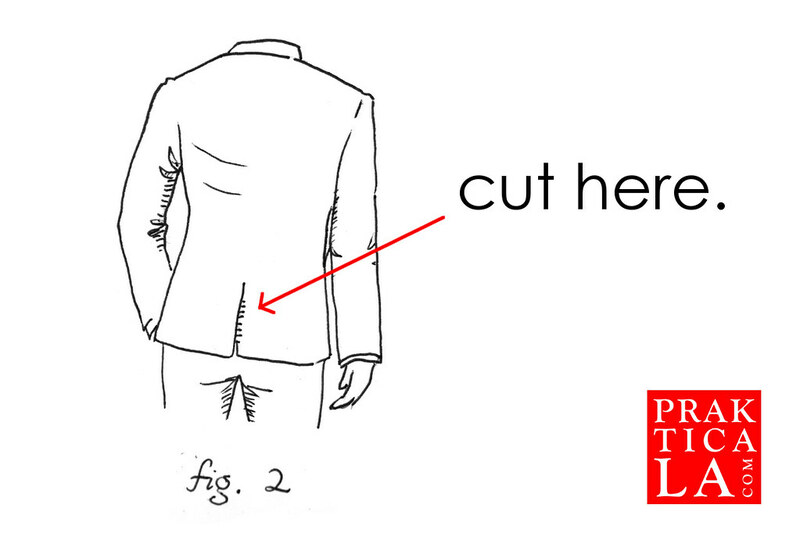 Suit jackets and blazers usually come with the vent(s) sewn shut (typically with a large “X” stitch). Many people think this stitch is meant to be permanent – I wore a corduroy blazer for ten years with the center vent sewn shut, not realizing the stitch was only meant to temporarily hold the vent together during shipping to prevent creasing. These vents, whether you have one vent (center) or two (one on each side), are designed to keep your jacket draping properly as you move around. Keeping them stitched together is a dead giveaway that you are at your first rodeo and have no idea what you’re doing. So grab some scissors and snip that stitch! Easy! While you’re at it, remember to cut open the front chest pocket (often stitched closed as well) and to remove the label stitched to the outside of the sleeves. Literally don’t do anything. EASY, RIGHT? I am so surprised at how often I see people buttoning all their suit buttons up, like they’re wearing a straight-jacket. I thought this was the oldest rule in the book, but I guess I was wrong! I made this mistake many years ago at a wedding (where I was also wearing pleats, unfortunately) and a considerate friend came over and popped the lowest button open, saying, “Never button the bottom button.” And since then, I never have. 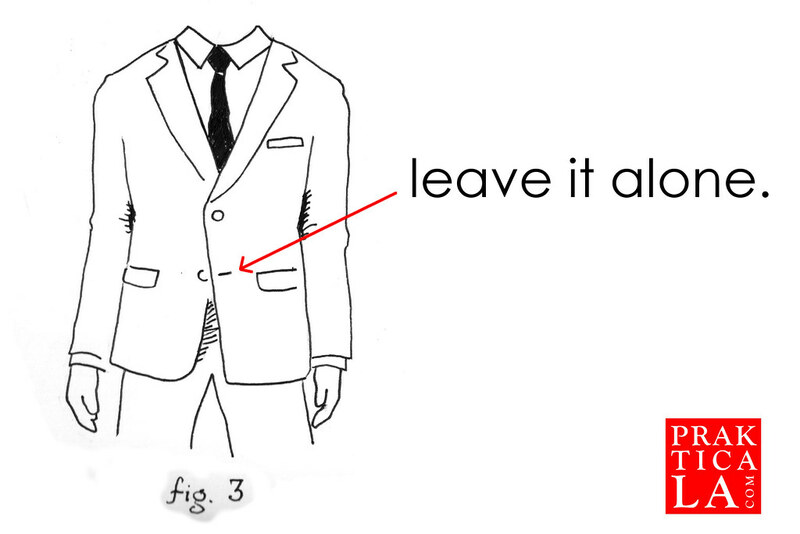 There are a lot of “rules” meant to help you remember which jacket buttons to fasten and which to leave closed. If you’re confused, just remember: NEVER fasten the lowest button on your jacket. This is true whether you have a 2-button or 3-button jacket. Again, the jacket drapes and flows properly when it isn’t cinched around you like a corset. That bottom button is for ceremonial purposes only. Don’t button it. There are obviously more fixes you can apply to your business style, like wearing good shoes or making sure you look like James Bond. 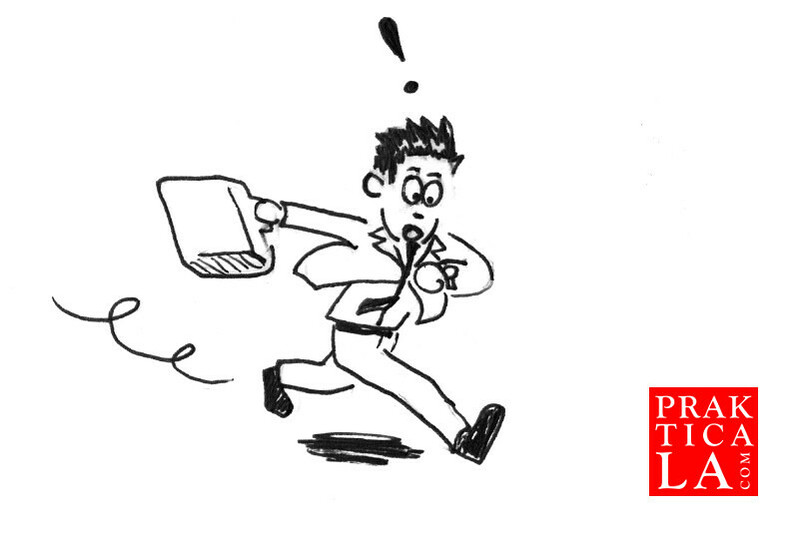 But in a crunch you should at least be able to address these three issues in under a minute! Any tips or suggestions of your own? Leave a comment below! P.S. Hope you like my drawings.